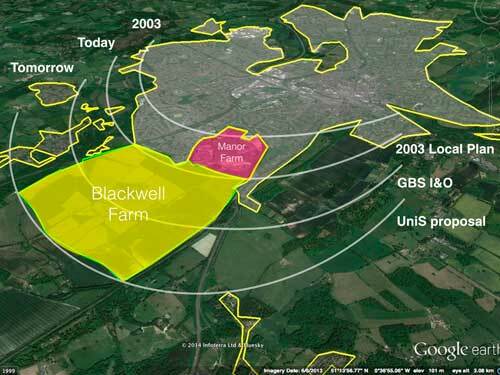 Guildford Borough Council’s Local Plan contains proposals for an extension to the Surrey Research Park and 1800 homes (the University of Surrey would like the figure to be closer to 3000) on Green Belt Land at Blackwell Farm. Blackwell Farm contains high quality agricultural land and is part of the iconic Hogs Back Landscape. It is featured in the Campaign to Protect Rural England‘s recent ‘The Countryside Next Door’ video as part of its ‘Our Green Belt’ campaign to highlight the value of the Green Belt (see the video clip below). The proposed development would also involve a major new highway slicing past ancient woodland and disfiguring the Area of Outstanding National Beauty (AONB) at the Hogs Back. Don’t let the straw that breaks the Hogs Back break London’s Green Belt. Let Guildford BC know you object to these proposals by sending them the postcard below by July 24. Alternatively, object online at Guildford BC Local Plan page, making the points below. adds to air pollution in neighbouring areas, which already exceeds safe EU limits for Nitrogen Oxides. NB: It is important to restrict your objection to these points as the consultation is only on changes to the plan and comments which do not refer to changes will not be accepted. The London Green Belt Council (LGBC) is giving the campaign to Save Hogs Back its full support and has urged Guildford Borough Council to remove Blackwell Farm and other Green Belt sites ear-marked for development from its Local Plan . The latest version of the Local Plan still contains plans to build 1800 houses at Blackwell Farm, and to extend the Surrey Research Park, despite vehement opposition during previous consultations in 2014 and 2016. The University of Surrey, which owns the land, made it clear in its response to the 2016 consultation that it would like to see 3000 homes built on the land .The proposed development would also involve a major new highway slicing past ancient woodland and disfiguring the Area of Outstanding National Beauty (AONB) at the Hogs Back. Blackwell Farm is featured in the Campaign to Protect Rural England‘s ‘The Countryside Next Door’ video as part of its ‘Our Green Belt’ campaign to highlight the value of the Green Belt . An excerpt of the video, showing the impact development would have on the iconic landscape at risk can be viewed here. Richard Knox-Johnston, Chair of LGBC said “If development is allowed on Blackwell Farm, there really is little hope for the rest of our Green Belt. LGBC, along with the Surrey Branch of CPRE and its Guildford District, also point out that the proposals fly in the face of new government proposals to require councils to explicitly search for ways to densify existing development before considering using the Green Belt . Campaigners additionally draw attention to the University of Surrey’s failure to build on land already taken out of the Green Belt at Manor Park 15 years ago – only one third of the planned university residences has been built since then. They stress that there are therefore no grounds to justify Green Belt land being taken under exceptional circumstances with this obligation still outstanding. Local Parish Councils are opposed to the Blackwell Farm development and have undertaken research into how practical the new development would be in terms of infrastructure impact, sustainability, and congestion. Other concerns include water supply, sewage, and flooding. The London Green Belt Council is a grouping of about 80 organisations with a concern for the Green Belt around London. These organisations campaign locally against development on Green Belt land and collectively they represent over 50,000 people. The Surrey Branch of the Campaign to Protect Rural England (CPRE) is a voice for everyone who wishes to save the Surrey countryside and open spaces. It works to defend the Green Belt and to ensure that development is kept within sustainable limits. It strives to protect country lanes and protect the unique character of Surrey’s villages and towns. Its AGM will take place on 21 June from 2pm-5pm at Painshill Park with Su Sayer, CPRE National Chair, as guest speaker. The Guildford Local Plan is available to view on the Council’s website at www.guildford.gov.uk/newlocalplan and the consultation will run from June 9 until July 24. The CPRE ‘Our Green Belt’ Campaign stresses the benefits of the Green Belt for our health and wellbeing as well as food production, flood prevention, climate change mitigation and much more. The full CPRE video can be viewed here . optimising the proposed density of development.